MacDailyNews Take: Of course, the iPhone would be the muscle. You want eyewear to be as light and stylish as possible, not big honking electronics on your face. Hopefully we can run with these as we want a heads-up display of our pace, HR, etc. which will be much safer than even glancing at Apple Watch when running on roads. Note: As iPhone was to Nokia and Apple Watch is to Swatch, Apple Glasses will be to Ray-Ban et al. Perhaps the same purpose, and reasoning of re-introducing the [next generation] iPod ? Apple will not be satisfied with selling iPods when they believe they can sell iPhones for 2X or 3X the price of an iPod. Those AR glasses will likely require the newest and most powerful A-series processor and Apple will never put that in an iPod. We’re likely talking high-end iPhone or iPad Pro. I can only hope Apple knows what it’s doing to bring back customers, but I have my doubts due to my belief consumers are tired of paying so much for Apple products as they no longer see the value of owning them. I hope I’m wrong. 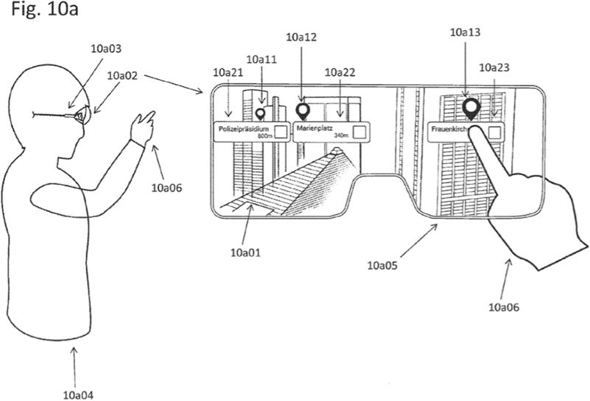 I’ll hold judgment until I can see an actual AR glasses product. Yes, of course, it will require an iPhone. Another complaint analysts and investors will have as iPhone sales continue to shrink. Apple will continue to attempt to build its ecosystem around the iPhone even as it continues to raise iPhone prices. I feel certain ever more consumers will be buying Android smartphones at lower prices. I just think Apple needs to stop depending so heavily on the iPhone if they’re going to keep raising prices on that product. I obviously don’t see many consumers running out to buy AR glasses, so this strategy doesn’t make all that much sense to me. I realize Apple can’t put a whole lot of processing power into standalone AR glasses but is a $1000 iPhone and a $500 pair of AR glasses going to be products consumers are going to be willing to buy just to play with a few AR apps? The goal should be for AR to work with recent gen iPhones (7 or 8 and up) and iPads (6th gen+). If it only works on latest and greatest then it. Similar to to a gaming rig, the better the CPU and GPU the better the performance and graphics. If it can work well enough on a A10 but better on A11,12 & 13 then great. I have no idea of technical and processing requirements, this is just my 2 cents. If it only works on latest and greatest then it really limits its potential market. Cook doesn’t want you to enjoy long service from your electronics. This is why Apple prioritizes “wearables”. They are sealed disposables that Tim will resell you every 2 years. The beauty of earbuds and glasses is they are lost and damaged frequently. Timmy won’t spend effort on cutting edge desktop computers because he mistakenly thinks disposable fashions are more profitable. Planned obsolescence is now a thing with Apple. First it was just annoying dongles and occasional software glitches. Now Apple is full on sealing products so upgrading is impossible. When your airpods die, you are supposed to trash them. When the next Macs are ever released, Apple has announced they won’t run 32 bit software even in a slower compatibility mode. Backward compatibility, that would harm new unit sales. Timmy would not like that. My guess is it will require A11 Bionic and up. The neural processor will likely be needed for this product. So, iPhone 8 and up would support it.